Fiji led 19-0 at the break and first the time this season a team which held the halftime lead went on to lose the final. 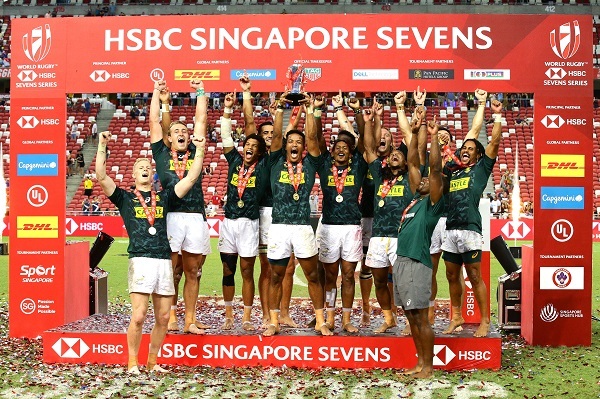 South Africa recovered from a 19-point deficit to stun defending champions Fiji and win the World Rugby Sevens Series tournament in Singapore on Saturday. Winners of the Hong Kong Sevens last week, the Fijians appeared to be on course for a second consecutive title in Singapore when they raced to a 19-0 lead at half-time in the final. However, the Springbok Sevens staged a big comeback after the interval with Selvyn Davids kicking a last-minute penalty to seal a 20-19 victory. England beat series leaders the United States 28-7 to finish third in Singapore. New Zealand’s hopes of winning the overall series title for the first time since 2014 suffered a massive blow after they were beaten 19-17 by Samoa in the fifth-place playoff to drop 15 points behind the USA in the race for top spot. South Africa won all five of their matches on their run to the final in Singapore which included a 17-7 victory over Fiji during pool play on Saturday before wins against Samoa (21-12) in the quarter-finals and USA (24-12) in the semi-finals. But they were blitzed by the Fijians in the opening half of the final as tries by Aminiasi Tuimaba, Napolioni Bolaca and Vilimoni Botitu put the Pacific island side 19 points up at the interval. However, the South Africans came back strongly in the second half and drew within two points of the Fijians at 19-17 after tries by Kurt-Lee Arendse, Angelo Davids and Ryan Oosthuizen. The comeback was completed when Fiji conceded a penalty right in front of the posts in the final minute and Davids drop-kicked the winning points to secure his side’s second victory in this year’s series following their triumph in Vancouver last month. South Africa’s victory means that the US remain at the top of the series table with 145 points, three ahead of Fiji on 142 with New Zealand third on 130. South Africa complete the top four with 121 points, 14 ahead of fifth-placed England. With the top four teams in this year’s series earning berths at the 2020 Olympics, the US only need six more points from the final two tournaments in London and Paris to book their spot in Tokyo. At the bottom end of the table, Wales secured five valuable points after reaching the challenge trophy semi-finals. They moved three points ahead of Japan in the battle to avoid relegation from the series with the last-placed of the 15 core teams set to be replaced by Ireland next season.